We are on a mission to raise $25,000 to Johns Hopkins Children's Center, so for home sale referred to us we are donating a portion of our income to them. This organization does great work in helping the kids fight through and recover from nasty debilitating diseases like cancer, leukemia, and non-Hodgkin lymphoma. Kids under their care are more likely to enter into remission IF they can get into the Children's Center. BUT, the Johns Hopkins Children's Center survives on Sponsorship and Donations. If you ever run into someone who is considering buying or selling a home you could refer to my company, please let us know! AND - When the referral actually makes a move with us, we will thank you again with a donation to Johns Hopkins Children's Center. Thanks to all our awesome clients for helping us reach our $10,000 goal! 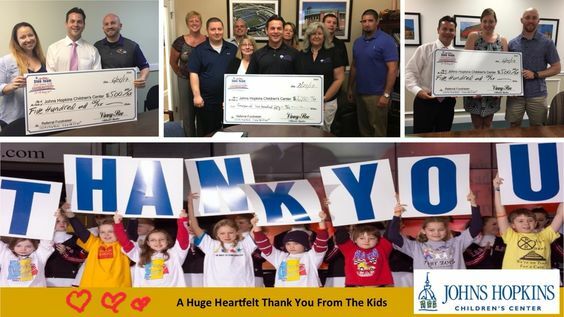 We are committed on reaching our next goal of $25,000 for Johns Hopkins Children's Center. So if you know someone who is thinking of selling or buying a home, please fill out the form on this page or give us a call at 410-793-1616. Thank you!